On our best day managing disasters is complicated. But managing a situation in a community that had high vulnerability pre-storm, was a hit by a massive hurricane, suffered near complete devastation of infrastructure and lifelines, when the national emergency management system was already strained and couldn’t fully function, when the federal government was in a general state of daily chaos, and the media didn’t show up, is as close to “worst case scenario” as America has ever gotten. Just about everything was working against Puerto Rico. I’m going to talk about the six biggest, most obvious issues. Puerto Rico was vulnerable before the storm ever even formed. The most obvious thing about Puerto Rico that made the entire island especially vulnerable is money. Puerto Rico has $70 billion in debt and a shocking 45% of residents (as of 2013) live in poverty. When you’re in debt or you’re living paycheck to paycheck you’re only going to be addressing your immediate needs. On an individual level: You don’t have the money to go out and build a sturdier home. You don’t have the money to stockpile days and weeks of emergency supplies. You don’t have money to buy extra insurance. 44% of Americans cannot afford a $400 emergency. On a community level: You don’t have the money to do community-wide mitigation projects or build up the capacity of the emergency management system. You don’t even have money to fix basic infrastructure – important, including the electric grid. People like to say that disasters don’t discriminate. That’s simply not true. Some people, things, and communities are more vulnerable to hazards than others. If you are economically poor and live in a home made of weak building materials your structure isn’t going to fair as well as your wealthy neighbor who has built to a higher standard. You don’t need an engineering degree to figure this out. This situation isn’t unique to Puerto Rico. Individuals, neighborhoods, communities, and countries around the world are just as vulnerable for these same exact reasons. There is obviously more to a community’s vulnerability than just their economic situation but it is one major issue. Hurricane Maria was an absolute monster. By our calculation, the average exposure in Puerto Rico was winds of 123 miles per hour. Normally, only small areas get slammed, and indeed some locations suffered through Category 5 winds of 158 m.p.h. But what stands out about Maria is that if you were anywhere in Puerto Rico on Sept. 20, you would have been experiencing something that felt like passing through a strong Category 3 hurricane. There was nowhere to hide. Though statistically inevitable, there is a certain element of bad luck that a storm this size, took this specific track, at this specific point in time. The impacts and needs were catastrophic. Though an important factor, storm size alone does not determine the size of a disaster. It is the interaction of the storm with us that causes the problem. In emergency management, we judge the situation by the hazard event scale. I recently drew this highly professional photo of the Hazard Event Scale. On the low end are emergencies. These are things like large apartment fires, the Boston Marathon bombing, and car pile ups. These are certainly a crisis but their impacts are relatively confined, the needs do not overwhelm the community, the people involved are trained in what to do, and they do so in a coordinated way. In the middle, are disasters. These are things like the Joplin tornado, the BP Oil Disaster, and Hurricane Sandy. These situations cover a wider geographic area than emergencies, there are widespread needs that the impacted community cannot address on their own, people and organizations who don't have training become involved, and, importantly, a significant amount of coordination must happen throughout the response. Then there are catastrophes. These are the big ones. The 2010 Haiti earthquake, Katrina and the levee failure, and the 2004 Indian Ocean Tsunami. These cover a widespread area, needs overwhelm not just the impacted community but also the communities around them, many people and organizations without training become involved and militaries or international groups deploy, and coordination is extremely difficult if not impossible. Often leadership must come from outside the affected community. 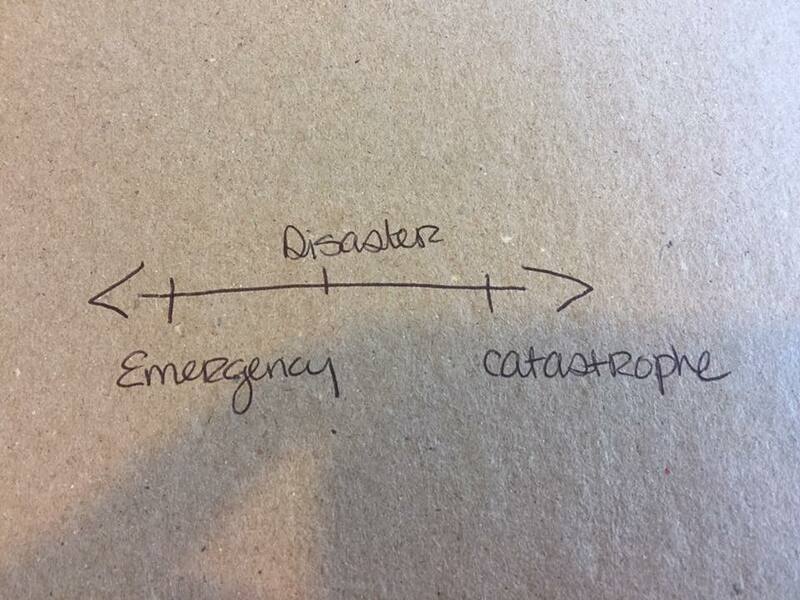 Emergencies, disasters, and catastrophes are categorically different. Disasters are not just big emergencies and catastrophes are not just big disasters. Note: The general public often uses the word “disaster” to refer to emergencies, disasters, or catastrophes without discrimination, which can be confusing. I think you can tell from my descriptions that the situation in Puerto Rico is a catastrophe. It’s very rare for the United States to experience a catastrophe which I think helps explain some of the confusion people are experiencing. In a catastrophe, "sending more supplies" is not the solution. The emergency management system was not operating at full capacity. In my opinion, the US emergency management system, as a whole, was strained. I don’t know how to quantify this right now which is why this is just my opinion. Researchers will have to study this later on. Generally speaking, though, any country’s emergency management system would be feeling it when a handful of small disasters, 2 large-scale disasters, and a catastrophe all occur within a month and a half. It’s just a lot y’all. The nature of the storm meant that the local community was immediately overwhelmed. They had more needs than they could meet. The added problems with communication meant they struggled to coordinate. This is what happens during a catastrophe. This is what makes it a catastrophe. This meant, as it would for any community in this situation, that help needed to come from the outside. Help always converges from outside the affected area during disasters and catastrophes. The issue here is that all of Puerto Rico was affected. There was no way for people to move freely across the island (fuels shortages, debris, damaged infrastructure, etc.). This is where, as the president has helpfully pointed out multiple times, Puerto Rico being an island begins to complicate response efforts. Usually, when there is a disaster there is a response from both the formal emergency management system and the informal emergency management system. I include in the formal emergency management system agencies and organizations that are trained to be a part of disaster response (e.g., FEMA, the Red Cross, the Coast Guard, first responders). They do a lot of work during response but they don’t do all of the work. There’s also the informal emergency management system. This includes all the people and organizations who didn’t necessarily plan on being part of a disaster response (e.g., churches, local nonprofits, businesses, grassroots efforts, new groups). They probably don’t have training or experience but they saw that there was a need and become involved. The informal system largely operates independently from the formal system. They improvise, matching resources to needs as the go without being a part of the larger coordinated efforts. The informal system isn’t operating in the way it did during Harvey, Irma, Sandy, Joplin, 9/11, even Katrina because they haven’t been able to physically get there. Puerto Rico did not have the benefit of immediate regional support that Texas found in Louisiana and Florida found in Georgia (and beyond). In first days after Maria it was not like Texas during Harvey where the Cajun Navy could just drive over from Louisiana and get to work. There was no way for them to get to Puerto Rico. As the days have passed this is changing. Groups have been organizing on the mainland from the beginning and will be ready to help once they get there. The informal emergency management system is a much bigger contributor to meeting needs than people fully realize. Puerto Rico had a huge piece of the emergency management system not there. Again, it’s not that people weren’t trying or didn’t want to help, it’s a logistical issue. I will note that the piece of the informal system that was operational was all of those types of groups that are from Puerto Rico. There were certainly survivors in Puerto Rico organizing groups and working together to address needs. This always happens. The problem, of course, is that there are so many needs during a catastrophe that the efforts of survivors are not adequate to address them all. This is exactly why help has to come from outside. Despite what the president seems to think, disaster survivors never just sit around and wait for help. Never. But they do need backup, obviously. You could have what is considered a perfect response from the formal emergency management system (not totally sure what that would even look like, tbh) but if the informal isn’t there, you’re going to struggle to meet needs quickly. The question I’ve been asked most frequently by journalists is to provide an analysis of the formal system. Everyone wants to know what went wrong with FEMA, the president, the military, and government officials. I’m not publicly giving my opinion on this until more information comes to light. I will say that there is no such thing as a perfect response when you’re dealing with a catastrophe. It literally does not happen. In retrospect, mistakes or poor decisions that were made will be revealed. There will be internal government investigations, congressional hearings, extensive research from academics in all manner of disciplines, journalists will file FOIA’s, documentaries will be made, and entire books written about what has transpired. It will mirror the efforts that have been made in the past 12 years, post-Katrina. The federal government wasn’t functioning. Completely separate from anything having to do with the hurricanes or emergency management, the federal government has been in a state of chaos for 9 months. Obviously, a government that doesn’t function in non-disaster times is not going to be able to adequately manage a catastrophe. There are things to be said about individual agencies and Congress but I’m going to focus here on the president because he is at the center of this perpetual chaos. I wrote during Harvey that the only operational thing for a president to do during a disaster is sign a Presidential Disaster Declaration. It’s slightly different in a catastrophe – more leadership from outside the impacted community is needed. One might expect that to come from the President. Also, as the military has become involved he obviously has a responsibility as commander in chief. Regardless of the operational role of the president, there is an expectation that the president behaves like a leader, in the most general sense of the word. At the very least, I think most people expect a president to demonstrate compasion and not attack disaster survivors on twitter. It is pretty clear that the president has failed to both be a leader and demonstrate empathy. If the past 9 months have made us certain of anything it is that the president takes every opportunity to attack marginalized groups of people particularly people of color and women. To state the obvious, most Puerto Ricans aren’t white. The comparisons between his statements on Florida and Texas as compared to Puerto Rico are revealing. It's not clear to me what the tangible impacts of his behavior is for the people of Puerto Rico but I'm happy to hear from them once their cell service is restored. The media just wasn’t there. Disaster survivors depend on the media to tell their story, to communicate to the outside world what is happening and what they need. Survivors depend on the media for information about the disaster itself – if they need to evacuate, how to stay safe, where to find shelter or food. The outside world depends on the media to tell us what is happening if our family and friends are safe, and how we can help. The media is supposed to hold everyone involved in the response accountable. I don’t just critique the media during disasters for sport. I do it because accurate, appropriate, and timely coverage literally can save lives. The media is one of the most important stakeholders in emergency management and, as a whole, they really just don’t seem to understand this. Last year during the 2016 Baton Rouge flooding we spent days yelling at the media about the lack of coverage. There are now 9 billion think pieces about this and a non-apology from the New York Times. The media was overall good during Harvey and Irma. They were physically there, sharing important life-saving information, holding folks accountable, explaining how to help, and just generally keeping us informed of the situation. Which is what they are supposed to do and what we expect and need them to do during disaster. Then Maria hit and for a few days, I thought I was losing my mind because there was shockingly little coverage of Maria, especially when you consider its severity as compared to Harvey and Irma. Fortunately, FiveThrityEight came through with the data. Good news: I wasn’t losing my mind. Bad news: The media really wasn’t covering Maria as much as Harvey and Irma. There are many reasons for this, some sinister, some logistical, and some because of a lack of knowledge about disasters. For future reference, when you lose contact with 3.4 million people it’s usually an indication that things are very bad and you should immediately ramp up coverage. Unlike in Louisiana where many survivors were able to post what was happening on social media themselves, this hasn't been possible in Puerto Rico because only 5% of the population had cell reception. This is also in stark contrast to Texas where throughout Harvey many people were able to maintain communication. This is also a moment where the all out war that the White House has waged with the media is threatening lives. Who and what are people supposed to believe? I’ve personally been sticking with the few first-hand reports that people are getting out on social media and trusted journalists who have made it there and are out interviewing people. Trust between the public, media, and government is important in a disaster and we don’t have it right now. I think this is a bigger problem than some are realizing. I want to emphasize again that Puerto Ricans are absolutely not sitting around waiting for help. The media and social media has provided enough evidence of that, not to mention 100 years of disaster research has found that survivors help themselves and each other. There will be plenty of heroic stories in the coming weeks as survivors are able to post online. Hurricane Maria would have been a catastrophe for any president and any administration but that does not mean that there are not things that could have and could be done to make this response more effective and efficient. What exactly those things are is something I can’t answer with only the information I have access to. There are a million moving parts in emergency management. Each of the things I’ve written about here deserves a more nuanced discussion and there are things I haven’t even addressed for the sake of brevity. Note: I’ve written this in the past tense for consistency and ease of reading but many of these things are ongoing. You should be able to figure it out.